The A465, or Heads of the Valleys road, is one of The Welsh Government’s key strategic corridors and an international gateway for the south Wales economy. The existing A465, a single three lane carriageway, was built in the 1960s with two lanes in the uphill direction. The dualling project will significantly improve its safety, shorten journey times, generally improve transport links and therefore benefit the local economy. 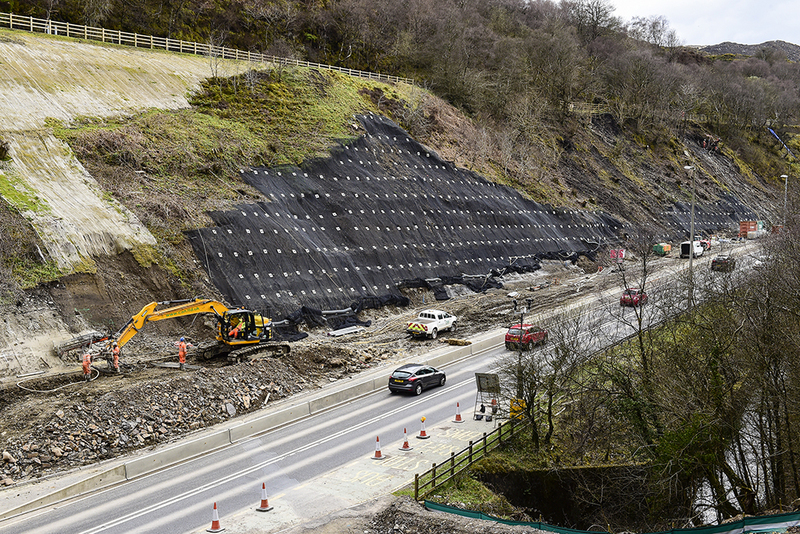 Since September 2015, CAN has been working as a subcontractor for Costain on the Heads of the Valleys A465 widening scheme. To date, CAN has worked on well over 25 individual sites along the road, carrying out a wide variety of different ground stabilisation techniques. Due to the steep topography surrounding the road and its complex geological history, a number of different approaches are required in order to widen it. In order to cut into the mountainside, the road boundaries have to be significantly steepened. In these locations, CAN has installed soil nails, rock bolts, sprayed concrete, gabions, erosion matting and rockfall netting. 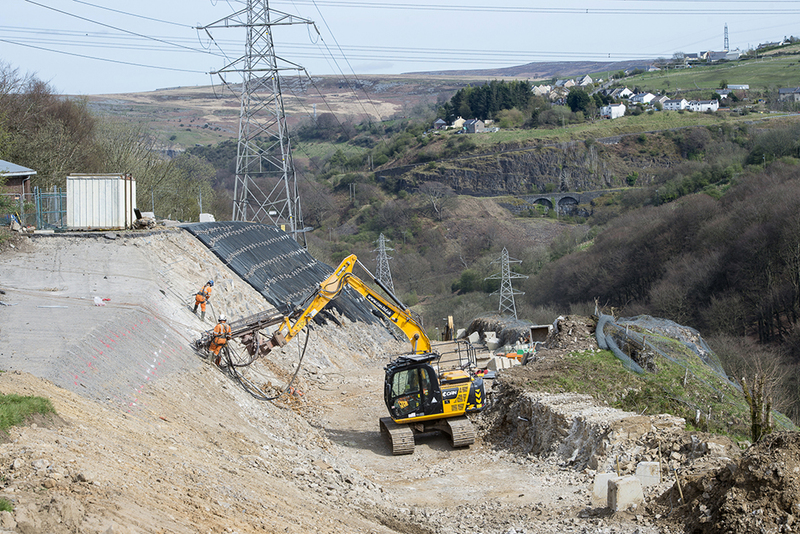 Where the road needs to be built outwards into the Clydach gorge, CAN has also stabilised the cut slope to provide temporary and permanent stability to the roadside. The extremely variable ground conditions mean that a wide variety of drilling methods are required. CAN use hydraulic drill rigs mounted to excavators to carry out the vast majority of drilling, as the roadside is progressively cut downwards. Where access is more difficult, such as when large cliffs are already present, bespoke ‘A-frame’ rigs are utilised that can be suspended at height from tirfor cables. During the construction phase of the job, several temporary works designs have been installed to ensure the safety of workers and the public. 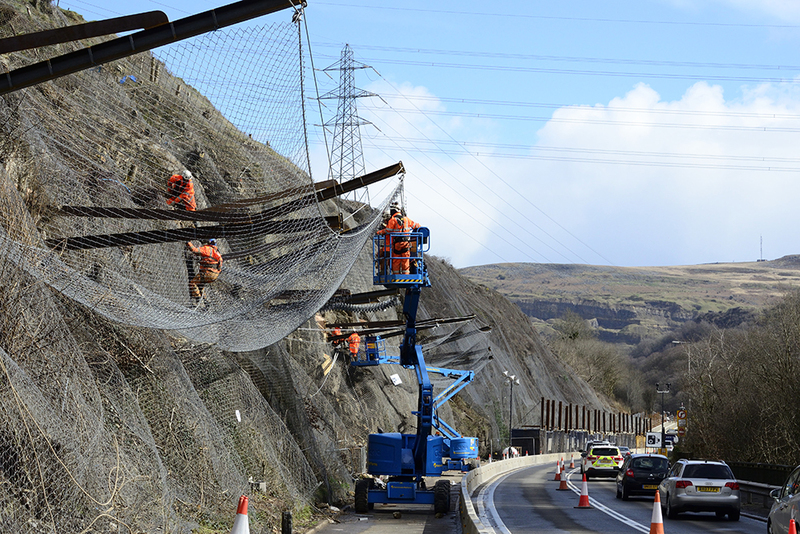 This included a 230m long, 1000kJ cantilever catch fence that was installed to prevent rockfall onto the A465 below. CAN has also installed a number of other bespoke catch fences and temporary netting to prevent rockfall onto the road. Small landslides have occurred during periods of wet weather and CAN have been quick to stabilise these areas so that works can advance. So far, CAN has installed over 10,800 soil nails/rock bolts – That’s a total of 44 miles drilled, an equivalent of 16,300 double decker buses length to length. 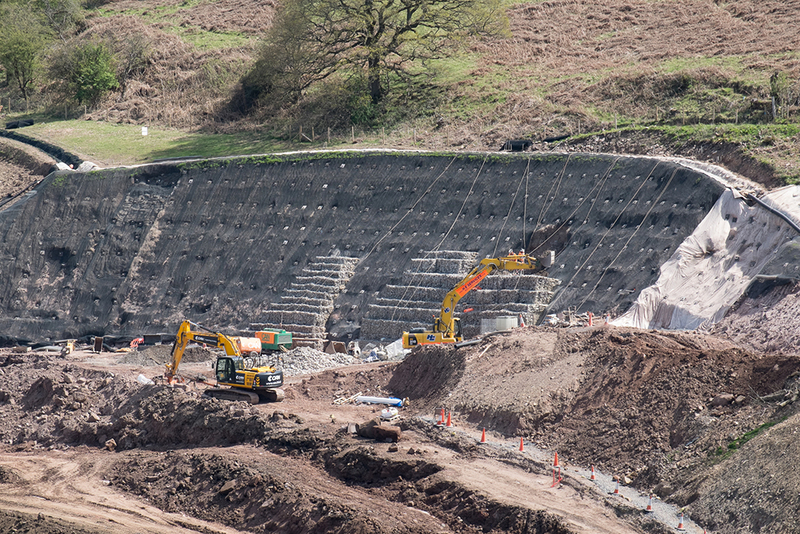 CAN has installed over 36,000m2 of rockfall netting, comparable to 5 football pitches. CAN has sprayed 250 tonnes of concrete, proportionate to the weight of 41 African bush elephants. Over 1,000,000 litres of grout has been pumped, which is enough to fill 5,000 bath tubs.